“Ne obliviscaris” is the Latin motto of the Scottish Clan Campbell and means “forget not”. This motto inspired the name of the Australian band, whose third studio effort Urn has just been released. Founded in Melbourne in 2003, the band has sought musical ways outside the frameworks defined by trends and the music industry and their crowdfunding approach has given the five-piece the necessary independence to seek their paths beyond genre boundaries. And indeed it is an altogether fresh approach to heavy metal music that NE OBLIVISCARIS take. The Australians' unconventional artistic mindset becomes impressively manifest on Urn. It is mainly the combination of extremes that makes the music of NE OBLIVISCARIS outstanding and this combination itself is taken to extremes. These elements are clean, ultra-melodic vocal lines (Tim Charles), harsh growls (Xenoyr), blastbeats taken ad extremum, a violin (masterfully played by vocalist Tim Charles) as well as and elements borrowed from various genres such as classical music, folk, progressive rock and so forth. All these elements are combined to a sonic experience that is as unusual as it is exciting. Unusual is also the structure of the album. The six tracks – all of them of extreme lengths – form, in fact, four compositions, because the first (“Libera”) and the last (“Urn”) come in two parts each. The first track, “Libera (Part I) – Saturnine Spheres” starts with a clean, somehow jazzy guitar part, which does little to prepare the listener for the kind of sonic hell that soon breaks loose and dominates the major part of the track. Tim Charles' expressive vocals hover over a machine gun of blastbeats before Xenoyr's growls take over. The folky middle section, dominated by the violin, comes a bit unexpected but still follows logically and organically from the preceding sections. “Libera (Part II) – Ascent Of Burning Moths” is a two-and-a-half minute classical-music-style afterlude featuring a finger-picked acoustic guitar and violin, preparing the stage for the following track, “Intra Venus”. This 12-minute piece, too, starts with a gentle acoustic guitar but soon builds up to an up-tempo blastfest – kudos to drummer Daniel Presland – alternating between singing and growling and features a laid-back middle section with jazzy undertones. The atmospheric beginning of the following track “Eyries” has a ring of Irish folk to it. This track is arguably the most progressive one on the album, consisting of a variety of different moods and elements that ingeniously combine to a complex but entirely organic composition. “Urn (Part I) – And Within The Void We Are Breathless” and “Urn (Part II)"form the centerpiece of the album. A doomy kind of riff, virtuose guitar work by Matt Klavins and Benjamin Baret, Xonoyr's substantial growling, and Tim Charles's clean singing that reaches extreme heights in this first movement of “Urn” all culminate to an orgasmatic violin solo soaring over a pulsating rhythm section and growling vocals. The title composition's second part is the grand finale of the album and allocates more room to the clean vocals, which, as good as they are, cannot really compete with the harsh vocals. Tim Charles displays a vocal range you wished you would hear on many a power or progressive metal release but at the same time his voice lacks the necessary power and distinction to really cut through the sometimes infernal walls of sound. Nevertheless it blends perfectly with Xenoyr's harsh vocals and on an album whose focus is more on instrumental elements anyway, minor reasons for slight complains about the vocals do not have a significant impact on the overall quality of the album. Combining musical and sonic extremes such as those on Urn requires top musicians and songwriters. 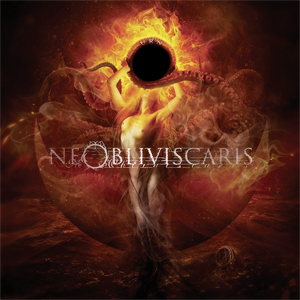 And this is without a doubt what NE OBLIVISCARIS are. The range of moods and atmospheres from utmost fragility to diabolic sound blasts (on the border of being a bit too much sometimes) are organically organized throughout the album without creating a single moment of self-indulgence, which shows good taste on the songwriters' part. More powerful clean vocals would do the band good, but all in all, Urn is an exciting album whose qualities probably don't reveal themselves the first time you play it. It is certainly a release which grows on you and it is worth digging into.